Hello Moto 360. Welcome back. One of my favorite pieces of tech for the past few years has been my Moto 360 smartwatch. I’ve had the kind of relationship history with that watch like some might have with the family pet. I remember the first time I saw it at the (online) store. Getting it home and all setup. The joys of learning the new things it can do. How helpful and faithful it was day in and day out. The compliments from strangers. How I never left the house without it. 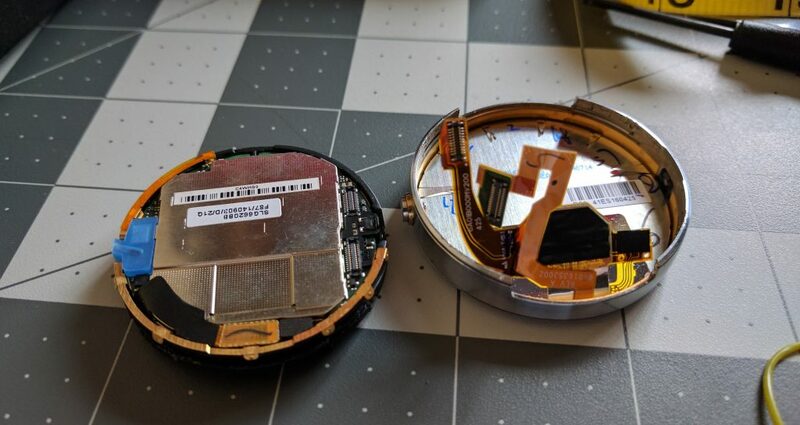 Then, my Moto 360 slowly stopped working. At first it wouldn’t last throughout the day. Then, the afternoon would roll around and it conked out. Finally, it shut off after a few minutes of being removed from the charging station. I pondered taking it out to the back shed, Old Yeller style. But I don’t have a rifle nor a shed. I also didn’t feel right replacing it. Nothing on the market really clicked with me. I was left with only one solution: an operation. Operate to fix what? 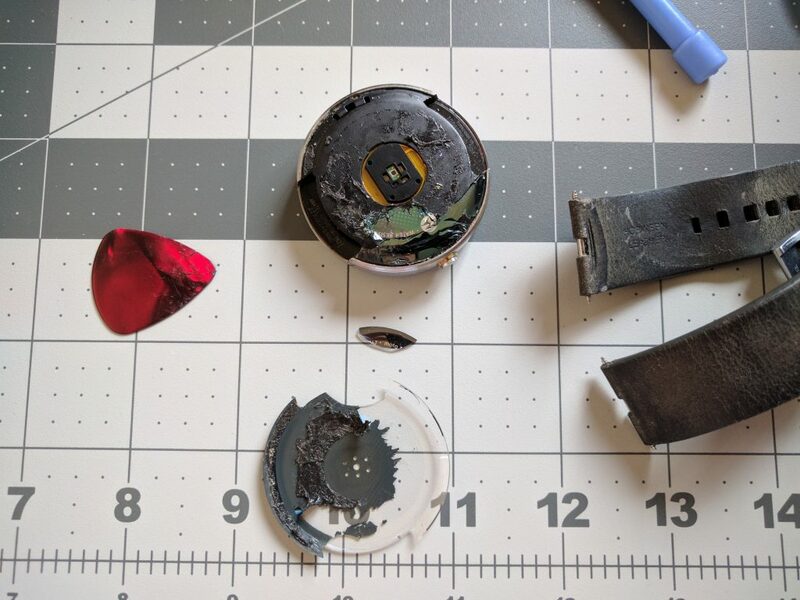 Well, I had a sneaky suspicion that the original Moto 360’s battery wasn’t holding its charge anymore. My goal was to replace it and see what happens. A $20 investment to do this seemed to be worth the gamble. A broken analog watch is still right twice a day. But a broken digital watch – it’s just dead. I was hoping mine was only mostly dead. I used the smallest flat head screwdriver to pry off the watch straps. There are pins on each side of the straps that hold it onto the watch. I stuck the screwdriver in to where I suspected the pin to be, felt it hit metal, and pushed it down. After a few tries, the strap popped out. The straps are standard watch straps so for more details to do this, use the internet for removing/replacing watch straps. There are a few methods for doing this. One is to use heat. The other is just to go for it. I’m impatient so I just went for it. 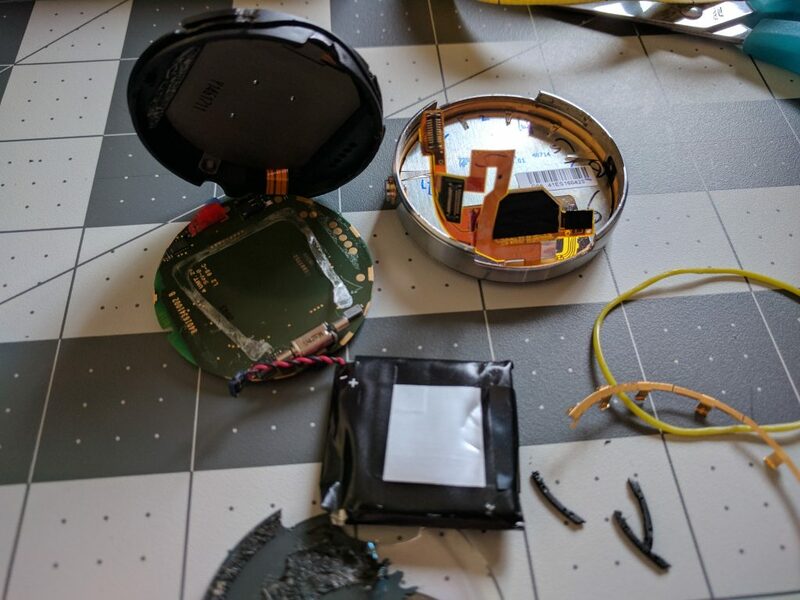 I used a guitar pick to start removing the back plate from the rest of the watch. It appears to be held on everywhere with just an adhesive. This is where applying heat might have been a better option as I started to crack the back. You can see in the photo below that I chipped off a small piece. 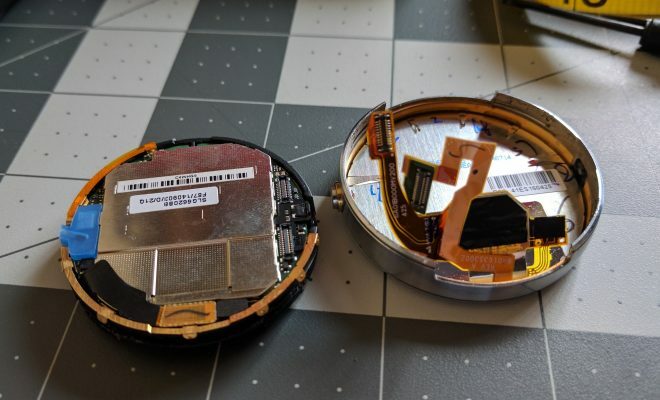 I stuck with it though and slowly worked my way all around the back of the watch and got the back plate off. Some foil (hopefully it’s just decoration) ripped in the process. 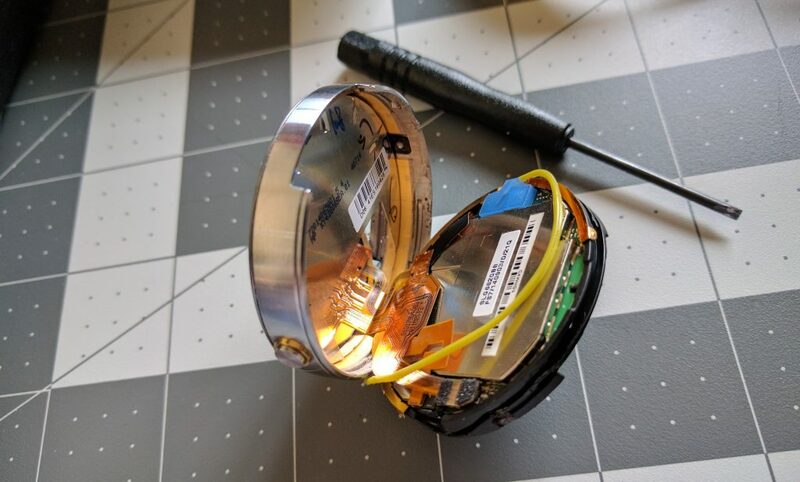 Thankfully, this is the unseen part of the watch. Simply pull open the inside of the watch from the face. You might need to use your small screwdriver for this. There’s a rubber o-ring around the entire watch to prevent water from getting into the components. Avoid breaking/damaging this. There are two small connections that need to be disengaged. I carefully popped them apart with the small screwdriver. Continue opening up the inside compartment. The battery can be popped off (it is glued in place around the edges) and disconnected. Connect the new battery. Go through all of the above steps in reverse to put the watch back together. Simple, right? Well, yes and no. I had the good fortune that the battery fixed the issues. 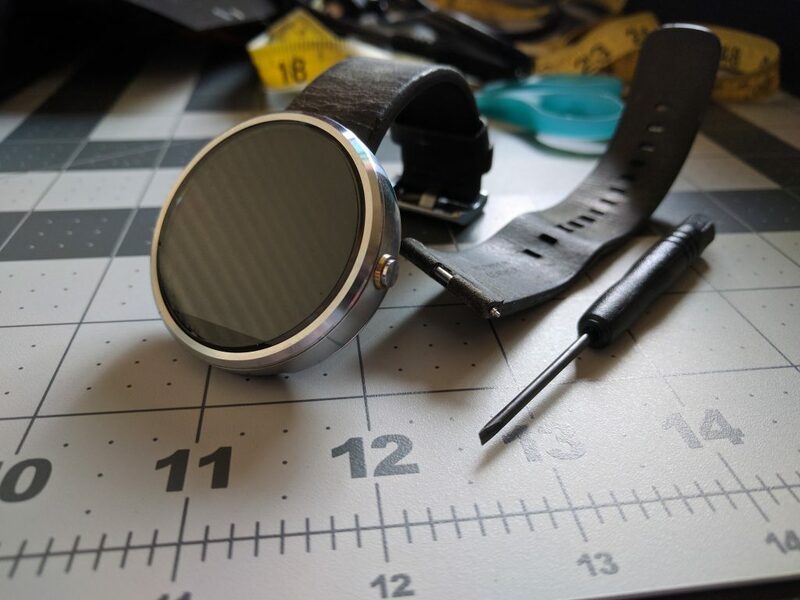 My Moto 360 works like a champ again and holds a charge like the first day I got it. All is right in my world again. 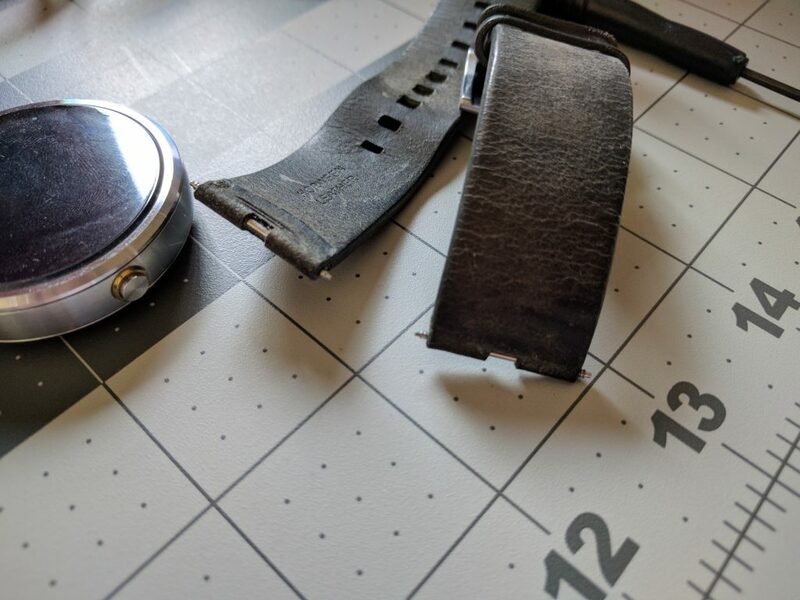 After wearing my Moto 360 for a bit I discovered a bummer. Because I had taken it apart, the seal on the back casing is gone and it wouldn’t stay together. The whole watch kept trying to slide open. My solution was to take it apart again (all the way to the battery compartment) and superglue the sucker. I added a few drops at every step except for attaching the straps. It was the only way I could prevent the watch from working its way open. Hopefully, this battery will last a few years like the original. Once it dies, there better be a comparable smartwatch out on the market!